Metabolic flexibility is a clever mechanism which has allowed us to efficiently hoard or expend energy in response to seasonal and environmental changes year to year. This process is controlled by nutrients, hormones, gene transcription factors and cell signalling systems that act just like switches. A metabolic switch essentially changes the way your energy is partitioned, stored and used in the body. Glucose and fats (fatty acids and ketones) can be used to make cellular energy, and can compete with one another (*). Subsequently, this goes on to affect the function of many other bodily systems, and eventually, the balance between health and metabolic disease. Metabolic (In)flexibility is the loss of the ability of cells and tissues to adapt fuel utilisation to fuel availability (*). Fundamentally, the imbalance between glucose and fatty acid usage can cause metabolic disease (*), including type 2 diabetes (T2D), obesity, cardiovascular disease, the metabolic syndrome (*), non alcoholic fatty liver disease and cancer (*). Essentially the goal with fats and glucose is to synthesise ATP, the bodies energy currency. Besides just generating ATP, these macronutrients, including protein, can be converted amongst one another. When fasting, fats may be converted to ketones to spare glucose for DNA turnover and blood sugar regulation. Also, when having eaten more glucose and/or fructose than needed on the spot, they will be converted to triglycerides (fatty acids + glycerol) and stored in the liver and fat tissues for later use. Excess fat is also stored as triglycerides, and glucose can also be stored in muscle and liver as glycogen. These processes are essential for the maintenance of a healthy body composition, cognitive function, energy, vitality and disease prevention in general. This is where the magic happens – Mitochondria are like small organs that live inside of cells. Arguably the most significant metabolic activity occurs within the mitochondria, where the vast majority of ATP is made (~ 36 molecules per unit glucose) from what we eat. Within the mitochondria lies a complex of enzymes which regulate the partitioning of energy, using pyruvate to make Acetly-coa which goes through the TCA cycle (see image below) to produce ATP. The complex essentially links fatty acid metabolism, glucose metabolism and the TCA cycle (*), (*). This is called the pyruvate dehydrogenase complex, or PDC for short. The complex uses Pyruvate Dehydrogenase Kinases (PDK’s), which are enzymes that can either up regulate or down regulate PDC activity. Here, the mitochondria must make a choice between acetyl CoA delivered by either the PDC or β‐oxidation (fatty acid burning) (*). Increased dietary fatty acids promote fat burning, storage and glucose storage (when low). Dietary glucose promotes glucose burning, storage and lipid storage, and inhibits fat burning (*), (*). This is the essence of metabolic flexibility. The PDK’s (and ultimately the PDC) and fat burning is controlled by a number of nuclear receptors, transcription factors, hormones and nutrients which act on behalf of diet, exercise and lifestyle in general. 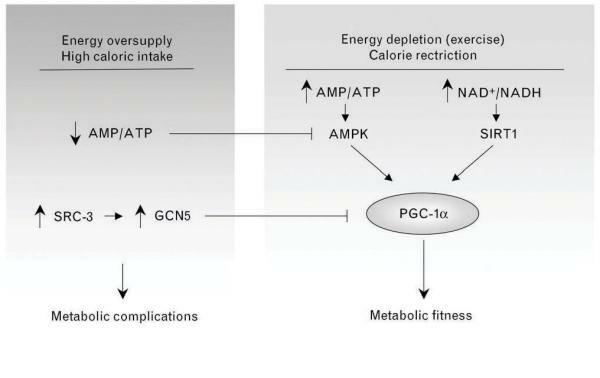 AMPK, SIRT1 and PGC-1alpha are key regulators of the PDK’s and fat burning, and act as an orchestrated network to improve metabolic fitness (*). We’ll see how those tie in later, and how they can be hacked to steer metabolic flexibility. A central hormone in metabolic flexibility is insulin. Sensitivity to insulin controls PDC activity, and essentially what fuels are selected, burned and stored. There are a lot of ways (In)Flexibility appears. Here are a few. Insulin signalling is pivotal for maintaining glucose and fatty acid metabolism balance. 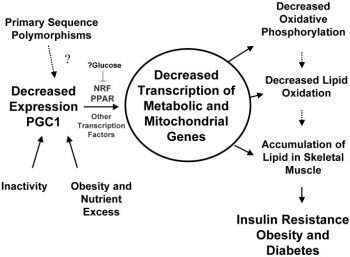 Insulin resistance forces compensatory mechanisms which not only reduce energy efficiency, but also drive metabolic disease. Insulin, under normal conditions, is meant to ↑ PDC activity and encourage glucose to be used to make ATP (and glycogen). Insulin resistance increases → ↑ PDK activity in skeletal muscle mitochondria that ↓ PDC → ↓ glucose oxidation and ↑ Gluconeogenesis in liver, which causes further hyperglycaemia (*). ↑ TNF-α (pro-inflammatory cytokine) induces insulin resistance in fat cells (*). ↑ IL-1β (another pro-inflammatory cytokine) IR in pancreatic β cells (*). This is contextual, and depends on the composition of your diet overall. Eg total calories, the relative contribution of fat type to total calories, dietary antioxidants, fibre intake and refined carbohydrate intake. In the context of a ketogenic/low carb high fat diet, a high fat intake may not be indicated here (providing these diets are rich in antioxidants, fibre and balanced in fat type). HFD → ↓ NAD+ content in tissues → ↓ SIRT1 activation (*) → ↑ Fat production and ↓ Insulin sensitivity (*). 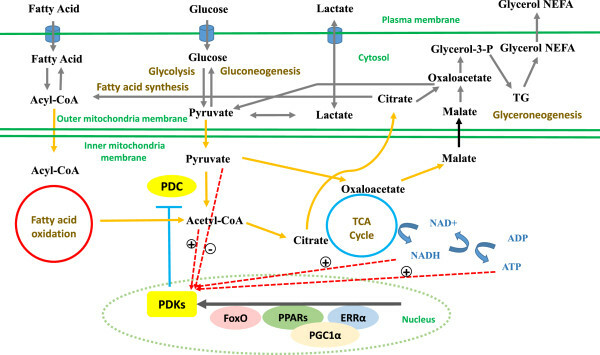 ↓ NAD+ → ↑ PDK’s (*) and → ↓ PDC activity (*), inhibiting glucose metabolism → diabetes (*) and some cancers (*). HFD → ↓ PPARγ expression (*). ↓ PPARγ activity may ↑ Fat production and↓ insulin sensitivity in obesity (*). Lipid overload→ ↓ PDC activity → ↓ glucose burning → ↑ gluconeogeneis and drives hyperglycaemia (*). The circadian clock (in the SCN – brain) regulates metabolic function, in part, through NAD+ and other factors to modulate SIRT1 activity (*). SIRT1 regulates metabolic fitness of mitochondria, and its activity is enhanced with melatonin (*). In other words, low melatonin reduces SIRT1 activity. Melatonin is a key sleep inducing hormone, which is sometimes offset with aytipical cortisol pattens – high at night. Also, its synthesis from Tryptophan/Serotonin may be an issue, possibly due to nutrient deficiencies, methylation issues and/or inflammation. SIRT1 regulates insulin sensitivity (*), which may explain why sleep loss also reduces insulin sensitivity by 30% in fat cells, which require higher amounts of insulin to uptake glucose (*). However, melatonin also reduces insulin secretion, which implies eating late at night (especially carbohydrate) overtime could lead to hyperglycemia/metabolic problems (*). Melatonin, it seems, has a stimulatory effect on insulin sensitivity, yet an inhibitory effect on secretion. As little as 2 hrs sleep loss over 1 week is associated with an increased secretion of IL-6 (*), which decreases insulin sensitivity (*). Sleep loss also increases TNFa, which perturbs the insulin signalling network (*). (Only in Men). TNFa can also reduce melatonin synthesis (*). Sleep loss also reduces leptin and adiponectin, which are AMPK activators (*). AMPK is a key metabolic switch for enhancing insulin sensitivity, and generally turns up metabolic efficiency (*). Growth Hormone reduces the uptake of glucose by cells, and sleep loss prolongs exposure of cells to GH (*), which could disturb glucose homeostasis. Sleep loss also elevates cortisol, which can contribute to insulin resistance (*). In the process of generating ATP with electrons (from macronutrients) through energy metabolism, signalling molecules called reactive oxygen species (ROS) are also made. At modest levels these serve as signals for mitochondrial maintenance, and antioxidants systems. However excessive production damage mitochondria, inhibiting metabolism (*), which perpetually increases ROS production further. Imbalances between ROS and antioxidant reducing agents is implicated in many functional imbalances, such as fatigue and brain fog, and chronic diseases such as diabetes. H202 (ROS) can damage insulin signalling enzymes, and desensitise the insulin signalling network (*), and therefore impair flexibility. ↑ ROS → impaired insulin synthesis (*) and pancreatic insulin secretion (*), leading to Insulin resistance (*). ↑ ROS reduces the efficiency of metabolic enzymes, including the PDC (*),(*) reducing nutrient flux and metabolic efficiency. Deficiencies of the nutrients that drive metabolism (CoQ10, Fe….). Biogenesis is the process by which mitochondria regenerate, and reduced biogenesis reduces the number of mitochondria available, which reduces metabolic capacity overall (*). PGC-1α regulates mitochondrial biogenesis in response to SIRT1 and AMPK activity (*). In terms of metabolism, inflammation can be induced from the overproduction of ROS. This is called metainflammation (chronic/low grade) and is a core driver of metabolic dysfunction (*), many functional imbalances and diseases. Increased ROS production activates the transcription factor NFKB, which mediates the systemic release of inflammatory cytokines TFNα, IL-6 and CRP (*). These cytokines can cause systemic Insulin resistance as macrophages infiltrate fat cells (*). → ↓ Metabolic flexibility and insulin resistance (*). Inflammation plays a central role in a vast majority of chronic diseases and functional imbalances, and metabolic inflexibility is one way which it can be induced. Exercise is about as essential as it gets for health and longevity. Metabolism, and just about everything else from gene expression to digestion respond to movement. 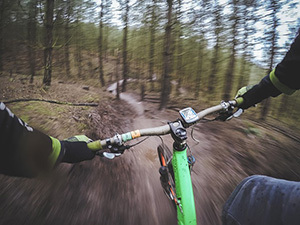 Exercise acts as a stimulus for genes, hormones, neurotransmitters, enzymes and transcription factors to maintain cellular metabolic functions. 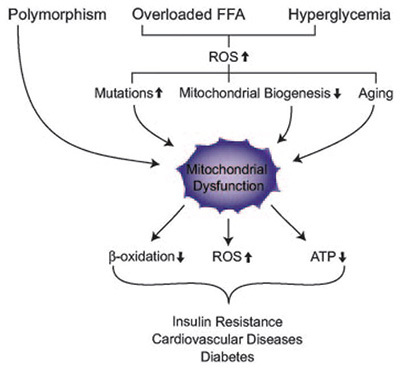 Low energy expenditure → less ATP demand → oversupply of electrons → ↑ ROS production (*), which damages lipids in mitochondrial membrane and drives mitochondrial dysfunction (*). Implications of imbalanced gut flora are increased gut leakiness, both in the colon (*) and small intestine (SIBO) (*). Increased gut leakiness allows products of (bad) bacterial metabolism called LPS to enter the bloodstream and initiate local and systemic inflammation (*). LPS activates NF-KB, and binds to toll like receptors (TLR4) to induce inflammation through cytokines including TNF-α (*). TLR4 are found on tissues which regulate metabolism, including fat, liver and muscle cells. Mice infused with LPS developed metabolic endotoxemia, characterised by increased visceral and subcutaneous fat, weight gain, elevated blood glucose and insulin resistance (*). T2D patients had up to 76% greater concentration of LPS than healthy controls (*), indicating gut imbalances could drive metabolic (in)flexibility. Essentially, improving insulin sensitivity, blood glucose control, stimulating fasting physiology and providing antioxidant support will be the key to improving weight, fatigue and cognitive function here. Exercise increases insulin sensitivity through improved glucose uptake into skeletal muscles. ‘Exercise snacking’ improved blood sugar control in 9 people with insulin resistance who exercised briefly before main meals (*). In a crossover trial, 15 minutes of post meal walking over 3 days reduced glucose and insulin by 17% each in T2D patients. The patients also engaged in 45 minutes of moderate intensity exercise over 3 days afterwards, which reduced glucose by 35%, and insulin by 33% (*). A meta analysis of 50 studies found HIIT (High intensity interval training) to effectively reduce fasting glucose, reduce weight, insulin resistance improve metabolic fitness in pre-diabetics (*). After 60 hours of fasting in healthy volunteers, plasma glucose decreased by 30% as well as insulin by 50%, in addition to increased rates of fat oxidation (*). Intermittent fasting for 2 days a week over 6 months in obese and overweight women proved to be more effective than calorie restriction alone. Weight loss was – 6.4 kg vs 5.6 kg, and reductions in LDL, CRP, and triglycerides were notable (*). 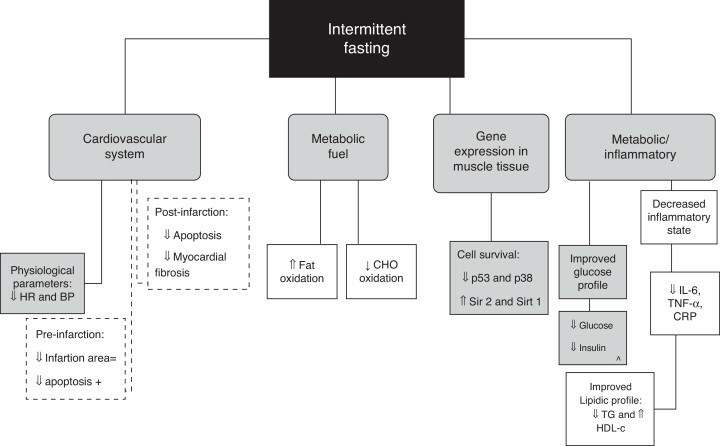 Energy restriction, including fasting and exercise increase NAD+ levels and trigger SIRT1/PGC-1α-dependent mitochondrial adaptation (*), improving metabolic fitness. ↑ Insulin sensitivity – Calorie restriction ~ 65% of usual intake improves insulin-stimulated glucose uptake in skeletal muscle (*). In older men, fasting and calorie restriction after 3 months produced less anger, confusion and tension, as well as better mood and body mass (*). Many clinical observations relate an early (between day 2 and day 7) effect of fasting on depressive symptoms with an improvement in mood, alertness and a sense of tranquility reported by patients (*). B adrenergic (Adrenaline) stimulation of Brown fat cells ↑ Turnover of triglycerides (fat) to maintain body temperature through heat production. A 10 day cold acclimatisation protocol increased metabolic activity in brown fat tissue, demonstrating an encouraging application for cold exposure in combatting obesity (*). Offer defence against ROS production, initiation of inflammation and mitochondrial dysfunction. Lack of dietary antioxidants is associated with certain metabolic complications in healthy young men (*), and a mediterranean diet rich in antioxidants after 2 years reduced body weight and improved metabolic function in over 50 % of those receiving it (*). A ketogenic diet will effectively bypass an under active PDC, as Acetyl-coa can also come from fats from beta oxidation, and go through the TCA cycle to produce ATP. A 2 year RCT found an ad libitum ketogenic diet to be just as effective for weight loss as a calorie restricted Mediterranean diet (*). Additionally, LDL and total triglycerides were reduced as well as increased HDL cholesterol. A Meta analysis of RCT’s found KD’s to be effective for weight loss long term (*). Improves mood and cognition in patients with PDC defects (*). 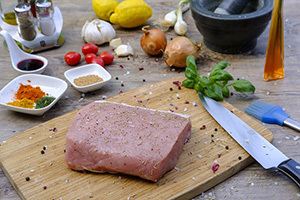 23 adults with mild cognitive impairment followed a ketogenic diet for 6 weeks, and had improved memory performance, which was correlated with increased ketones (*). In addition, there was a hint at a relationship with insulin reduction. Nrf2 is a transcription factor, which is activated by plant chemicals, and small amounts of environmental stress. Nrf2 activates your own built in antioxidant system, inducing antioxidant enzymes which drive the synthesis of glutathione (*) – the master defender against oxidative stress. Reduces ROS, and maintains NAD/NADH ratio (*) to favourably regulate PDC activity and flexibility. Phytonutrients like curcumin, sulfurophane and EGCG activate Nrf2 (*). 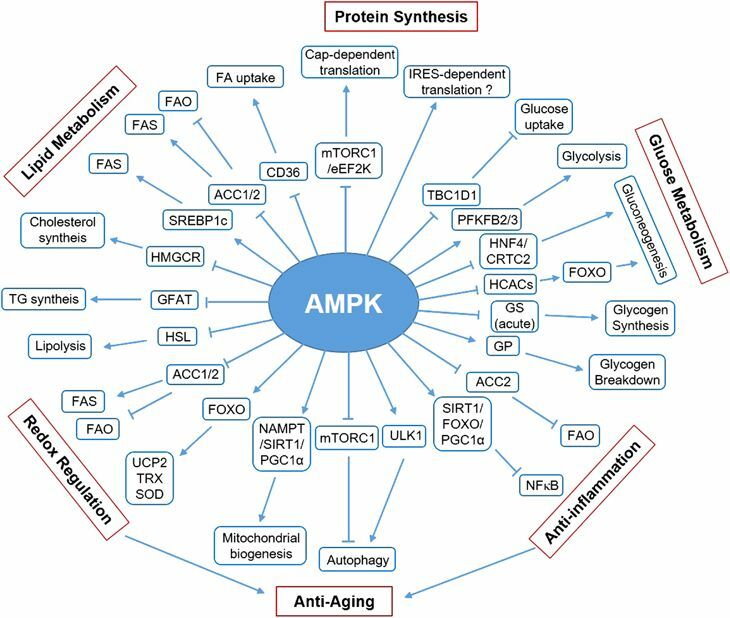 AMPK is an enzyme which maintains cellular energy homeostasis. It regulates many physiological processes and is dysregulated in obesity, diabetes, inflammation and cancer (*). Because of its diverse regulation, its a good place to ‘hack’ metabolism, in addition to addressing macronutrient ratios, caloric intake and eating frequency. AMPK activates PDC (*), and increases PGC-1α (*) enhancing both mitochondrial metabolism and structure. Niacin (B3) – Sirt1 activation. Increasing NAD+ content leads to higher SIRT1 activity (*). In addition to PGC-1α, SIRT1 also activates (FOXO) transcription factors, enhancing the expression of lipid oxidation and oxidative stress protection genes (Brunet et al, 2004). Insulin Inhibits PDK activity and increases PDC. Inhibiting PDK improved glucose and fat homeostasis in obese mice (*). Increasing insulin sensitivity may therefore allow better regulation of PDC through inhibiting PDK’s, and reduces the demand for the pancreas to overproduce it. This should help maintain a healthier weight. α-glucosidase Inhibitors slow breakdown of starches to sugars in GI tract → ↓ Blood sugar response.